Update: Congrats to Jessica #30!! Enjoy! Knew I wanted something happy for spring (I'm a little early). It's big. I like that. It's about 18x44". I honestly enjoyed every minute of making this. I did the little paper piecing petals while watching TV. Des showed me how to do the vine. She let me use her mini Clover iron for the leaves. (I want to get one of those, cause I'm sure I'll be taking the applique world by storm). that actually includes the English paper pieces for the flowers. We have a few kits, so you can make your own. You only use half the charm pack, so you could always make another. Sweet charm packs are also available on eBay & etsy. I am not giving away the runner. Nope this will be buried with me (des, make a note of that). We're giving away a Sweet Charm Pack today. What are you going to do today -- that's sweet? Please make sure you have an email address that we can access. A lot of winners haven't won, because we can't email them :-(. did I make you look at enough pictures? do you need more? I'll work in my office all the day but I'll also think to the next project I'll make with Corrie's fine fabrics "Vintage Amaerica", probably a small school and vocabulary boxes for my grand children! !have a good day in USA. so I might have time to sneak in a bit of sewing,fingers crossed. Today I'll be eating some chocolate...that's sweet. And I am making a taggie blanket with my 4 yr old - that is super sweet! What a gorgeous table runner! I am going to bake a chocolate cake..hum..
love your runner! just recovering from operation on appendix and today I hope sit out of bed for a short while again. Yay! back on the road to normal! Gorgeous table runner! Today I am making a bag for a child. I hope to be beautiful! Oh wow...love your runner, front and back!! Now that is just darling. I love the Sweet line...Im afraid I would have to buy the pattern should I win!! I am making chocolate chip cookies with the kids today...butter is out and getting soft now! Thanks for a chance. Today I will be finishing my MIL's chemo quilt. Today i get to do some sewing...for the whole morning! That is SA-WEEEEEEET! add some chocolate and lots of Cherry Coke...SA WEEET overload! Thanks for a chance ladies. today I'll be working. 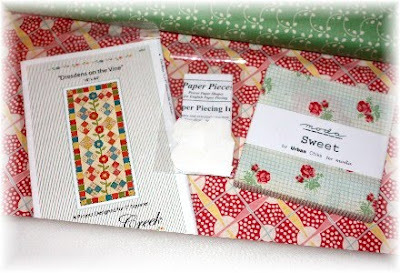 my sweetness will be after work and after meetings when I get to come home and sew! Had a tablerunner kit sitting in the closet so I've cut it out and found there was enough fabric to make two. So today I'm going to sew them up. Love your runner! This morning I get to go to the eye doctors for a new pair of bifocals! I can't sew if I can't see it! Then, I'm going to finish quilting the wallhanging I made with my Moda Bake Shop Sampler 2 1/2" squares. I am going to brainstorm with my husband today about the houses we are looking at next week! We are going to purchase our first house soon! Well, the table runner is a hit with me! I absolutely adore the little hex flowers and the colors make me want to grab a bowl of fruit! Great job! What am I doing that's sweet? How are all those things "sweet"...I'm doing them because I love my family! Going out to dinner with my daughter is going to be my sweet treat. Love the runner and you had just the right amount of pics! Lovely table runner! I am going to be finishing up a quilt for my year old today. Oh, and I will also be baking some really yummy double chocolate chunk cookies. Today it is housecleaning day, and after the work is done, I will treat myself with some stitching or knitting! That's sweet! It's my turn to have one of my quilting groups in so we will be sewing and eating. I've made Food for the Gods bars for dessert. Anxious to try them. Oh, I would love a Sweet charm pack! Today (after a three hour graduate lecture) I will be making muffins that have an apple cinnamon filling; I think that's pretty sweet! Today, I am quilting two sweet quilts for nephews - bright story quilts made with I Spy squares with signature squares by parents, grandparents, aunts and uncles on the back to cover them with love. That is so cute!!! I'm taking my kids (on break from year round school) to the mall for a playdate with a sweet little friend. Thanks for another great giveaway! Take the dog for a walk and let her run around with her leash off, make brownies for the kids and play tennis with my daughter, even though I have no chance against her and hopefully sew a little. I'm also doing laundry and scrubbing the bathrooms, but that is not sweet or fun. gorgeous work Corrie. i'm going to do some peaceful things today. knit. read. and make a few more hexagons. Hi. I love your tablerunner, I belive I have to look in my stash to see if I can make me some small flowers to. I will be playing Strawberry Shortcake with my daughter. Can you get any sweeter? LOL! My quilting group comes over today. Sweet! Then I'm thinking I'll make some bread -- banana and regular white. Sa-WEET! Then, my new front-loading washer and dryer are FINALLY going to be delivered today. Double Sa-WEEET! Cannot wait. To do laundry, you ask? Yes, it's true. In my new fancy machines instead of these dinosaurs I've got workin' round the clock. Could use a sweet charm pack for sure. Your table runner is fantastic!! I'm going to the SPCA today. I'm hoping they still have the guinea pig I saw in the paper! I am going to be sewing tonight after work--I decided no work for me, just fun. Now, that's sweet! Thanks for the chance at the giveaway. That's a generous prize! It's SWEET of you to offer this! I poured my SWEET hubby his coffee. I added flavored creamer to mine -- just the right amount -- SWEET! After near-zero temps last week, today's in the 50's... SWEET sunshine! Got a bit of housework to do, then I can play... SWEET! Today I'm hanging with the kids because we homeschool, I took the dog for a long walk, and I'm dying to get my hands on the appliqueing I've been doing. What a great table runner. I love this one! I'd like to order it, but live in the U.K. until March and don't want to pay the kind of shipping fee it would be. You also might not mail things outside of the U.S. anyway. If you do, let me know what it would cost. Oh, and thanks for the giveaway! Cute table runner! Love the colors. today i'm off to a pilates class then back to my wonky log cabins! I am going to tidy up the house and then start organizing this very messy craft room that I am sitting in! I can't even function in here is so messy! I LOVE your table runner! Oh wow such a cute runner! 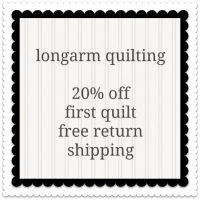 Today I am working on straightening up my sewing area, so I can QUILT :-) Thanks for entering me in your great giveaway! I can see why you love love love this tablerunner. It's definitely sweet, very sweet. I'd love a chance to win the charm pack too. It would be sweet to win. The only sweet thing I'll be doing is hopefully getting a bit more of my mini quilt done. It's funny how much longer small pieces take. Love the table runner and fabric!!! Today I will cleaning up my sewing space. That's at the top of my list. 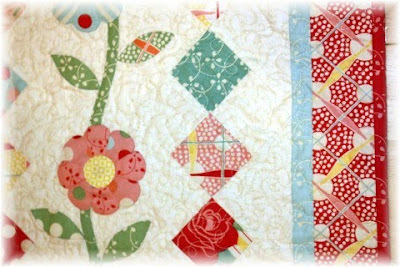 If I have time, I will be making my January block for a quilting bee I just joined. But the room HAS to be cleaned up first! Beautiful runner!! Today I've got kids to get to school, house work, fishtanks to clean, #1 son needs to see Dr., try to keep a friends spirits up (her hubby went into hospital yesterday), another friend is over for supper (her mother just came out of the hospital), pick up kids and somewhere in there try to squeeze abit of sewing in and knit a few more rows on a tea cosy! You know just another day in paradise. Oh my goodness, but that is adorable!!!!! I would keep it out too. It just says "spring" all over it. Today??? I have a doctor appointment with my mom and then taking her for her yearly ultrasound. Busy day. Your table runner turned out beautifully! No wonder you want to be buried with it:). I love this fabric and I mean LOVE it! I just made a grocery dispenser with this fabric and it turned out so cute!! I would love to win this and make a mini or baby quilt, maybe a baby pillow. Today is a free day for me so, I will be playing!!(sewing:)). Thanks for the chance to win!! ouuuu, so purddy!! i love the colors :) today- i want to exercise and take a nice long shower, if i can get that in- it will be sweet :) ha! Something sweet?! : I will start working on 16 (!) Snowflake costumes for my girls' preschool and matching hairpins for all the girls. That will keep me busy for a few days. My Grandaughter's birthday is next month, so I going to cut out some clothes for her American Girl Doll, then off to work this afternoon. Love your table runner, so fresh and happy. I'm working on RAK parcels today. Sweet indeed. I have the day off and no where that I need to be. I am heading up to my sewing room and see if I can find my mojo that seems to have been misplaced. I love that baby! Sweet is so great (still). Today that's sweet: going to my son's basketball game. Other things not so sweet: working, funeral, etc. Thanks Corrie. So so beautiful and bright and colorful! Today I'll be working. Then if it's not raining, I'll take my dog for a walk and finish off the evening with some sock knitting and quilt designing. I will be working on a valentine table runner and going out to coffee with a group of friends. That runner is just darling! Something sweet today?...well I'm taking my kids to the bookstore to spend Christmas money...they think that's pretty sweet! I am going to relax and play with my little boy today! Headed over to my daughter's to check on my 7 month old grandson who just got his shots this morning, then on to do some quick shopping & then back home to my sewing room for a couple of hours before having to make dinner. 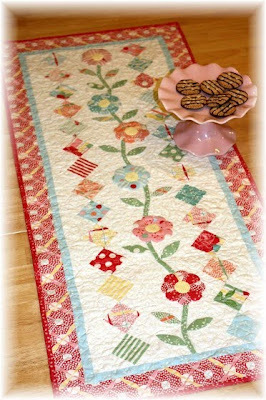 Love the sweet table runner. I love that sweet line! I have a sweet little 3 year old boy that just tooted on my leg, SWEET! Oh this fabric line is so darling! And your table runner turned our fabulous. I'm not doing much that is sweet today (just work) but I am looking forward to the chicken salad sandwich that I packed for lunch. Yum! Does bittersweet count? My hubby and I are going to an informational session for parents who have kiddos entering Kindergarten this fall! I can't believe my first baby is getting to be such a big girl! I'm going to buy fabric for a new quilt, a baby bib and supplies for a Valentine Swap I'm participating in. Very Pretty! I'm planning on working on my XMAS quilt once I get off work. Only 1 more section and the borders to quilt. Hopefully,I'll finish it up today, then start on making the binding for it. 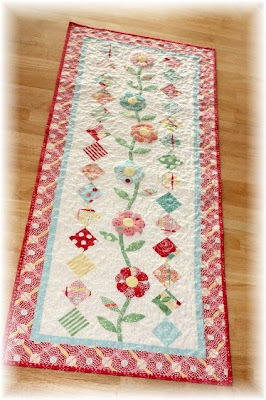 Lovely Table runner, so fun. I have to work today, get my house organized in the afternoon and just maybe tomorrow I can sit down and sew. One can hope. I love your table runner! I'm going to sew when I get home from dropping my daughter at school. Yippee! The table runner is gorgeous! Very nice work. 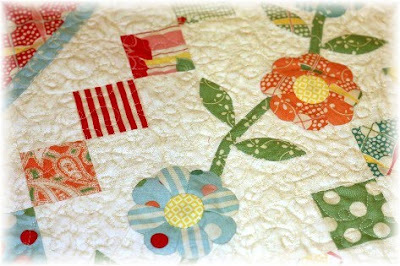 I have a quilt for our family reunion that I am getting ready for the quilter. Thanks for the give away. You have lots of comments already. I'm going to eat chocolate! Tomorrow I get to sew. Today I hope to get my charity quilt bound...at leat trimmed and bininding strips cut and sewn together. Does doing laundry, cleaning the bathrooms and volunteering at the school count? oh yeah, i'm going to a birthday party for a sweet 2 year old tonight! Sa-weet it is! Love it. The sweet thing I did today was listen to first graders read (at my grand daughters school). Then I will go to her school and run copies for her teacher, and run packets for tonite's PTO meeting which I am secretary. Then I'll pick up my Precious G'daughter and have sweet times with her today. It's gonna be a SUPER SWEET DAY ! Well once I get some quiet time tonight, I'm going to continue working on my new quilt. Which has some sweet little birdies on it. 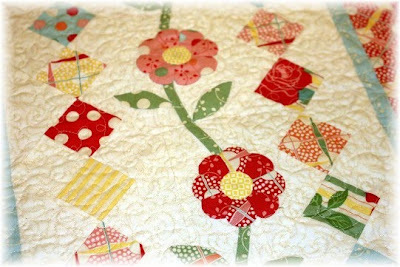 Beautiful project, and gorgeous happy fabrics. My favorite. I get to pick up my oldest daughter from school (four day weekend, no homework!) and take my two girls shopping for ballet and tap shoes, maybe sneak in an ice cream cone while we're at it. So sweet to me! That table runner is fabulous! It looks really hard though........What I will be doing today is working in the school office where I work all day until I get off at 3:00 and THEN I will make another one of those darling zippered pouches that you were kind enough to give us a tutorial on. I made one yesterday and I love it! Now I want to make more. Thanks for the chance on the Sweet charm pack. Maybe I would dare tackle something brave like a table runner if I won it!!!! I'm going to play with my (usually) sweet 1 and 5-year-old daughters. My e-mail address is my username @ gmail dot com. Thanks! What a sweetly beautiful table runner! 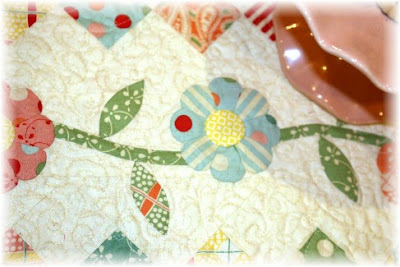 My sweet activity for today will happen much later - cutting out fabric for a quilt for a sweet new baby boy. Cleaning up a little, then back to a baby quilt I am finishing. Love the table runner. Spring is the word!! Trying to put some order back into my sewing room. Fold and stack fabrics, using the ruler fold method. This makes stacking so much easier. Then off to sell sewing machines, (I hope) come home, make dinner, clear up the dishes and sit down to finish a Lemoyne Star block for Sylvia's Bridal Sampler. Thinking of a "sweet" friend who lost her Dad last night. Oh Corrie, you're going to kill me for real, I adore the table runner!!! !, it's the most gorgeous quilt!!! 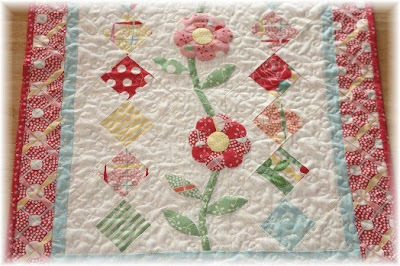 !, love the colors of it and the design, well trying to recover, I'm going to try to make an appliqued christmas quilt, I know you're thinking about spring and I'm thinking about christmas, LOL, I'd like to have this quilt ready for christmas this year! Something "Sa--weet" today ~ well, I get to go hold my little grandbabies today ~ that is way sweet! I am hoping to bake my favorite lemonn poppyseed SWEET bread today! Thanks for the chance to win! LOVE the table runner, too! I'm going to enjoy my birthday today! Today is almost over for me The dogs have been out for there adventure this morning then a dress that i was making for someone else has been finished. I have just washed up having cooked supper for the family. What I'm going to do today is help my neighbor find the owner to a stray pit bull she found near our house. The MP's said either find the owner, keep her yourself or they'll have her put down. So we're going door to door looking for the owner. Wish us luck. Today, I'm starting a new doll. She's going to be a "Boudoir" type of lady, and I plan on using some of the materials (silks, laces, beads, etc.) that I already have. It would be nice to have another charm pack to use, too. What will I do today that's sweet? My sister comes home every six weeks to have a Remicaid treatment (for Crohn's Disease) that tends to knock her out for the day. I'll make her whatever kind of cookies and junk she wants for dinner. The day of her treatment is usually the day she can eat junk without getting sick, so we make the most of it! I have some appiontments. yay me. That table runner is adorable. I love the springy colors. My sweet daughter has the flu, so I am taking care of her...I am snacking on mint chocolate cookies though! I L.O.V.E your table runner!! I am going to eat chocolate. I finished up a donation quilt today and have been looking through patterns to start another. I love your table runner. Maybe thats what I will do today-learn how to turn on and thread my sewing machine. Am I blind? I don't see any hexagons! I think this is it, it's finally time for new glasses! i am after a small sergery in my mouth..
i guess ill try to rest cues i am in pain..
but to something sweeter: your quilt looks super great!!! I don't know what I'll be doing for the rest of the day...I want to be productive, but that's not likely. I just received my package of two Schnibbles patterns and 5 charm packs in the mail today--Love them all! Thanks so much! 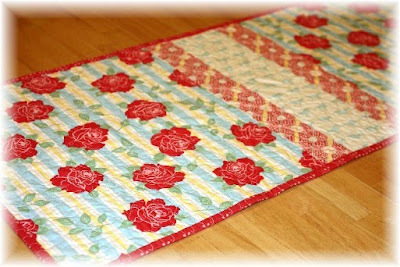 I love your table runner--will think about doing one after all of my valentine sewing! I spent all day sitting in an empty living room waiting for new furniture to be delivered.. I went on an impromptu quilt shop hop with my friends today in Augusta, GA.
Now just resting and catching up on the internet things. I was away for two days! Those fabrics are oh so sa-weet. Love it! I went to my sweet friends house today and we applique'd together. Good times. super cute and oh so springy! The second grade had their music performance today and it was sweet! I am making a dolly quilt for DGD,for her new dolly and cradle! Also a pillow to match,she is only 8 years old,be we sew together and she has the love of fabric already. I would love to try this technique and this pattern is so sweet! what a pretty tablerunner! i'm jealous. the sweet thing i'll do today is give my 3-mo old baby girl tons of kisses! thanks for offering the giveaway. Drop off at school, go to work, do a pizza pig out, return to work, throw things at my computer, come home kiss hubby goodbye for the night, eat dinner that hubby coooked and get on computer, before folding laundry, putting kids to bed and getting ready for tomorrw. And it all starts again. Have a happy day. I baked gingerbread cookies with my daughter - an eclectic mix of "men", sailboats, bells, reindeer, trees, flowers, and lambs. Icing, redhots, gumdrops: sweet! Congrats on finishing that beauty of a table runner. Clean...clean...sew! ;-) Oh, and watch the kiddos (that's my number one)! I'm recuperating from a tummy tuck! So, I'll be watching Ophrah, The View, and all the other shows I don't get to usually watch. I can't sew cuz I can't sit up straight! What a gorgeous runner, I will have to get one of the kids I think. That IS a sweet runner! So cute! I got that little iron for Christmas (and all the tips). Today - slept in - SWEET! Didn't work - SWEET!! I actually am on while the day will be ending but I can tell you what I actually did that was sweet. Today my little 9 year old daughter and I made some flower shaped sugar cookies and we finished frosting them awhile ago. We had so much fun baking Christmas cookies and she wanted to make the flower shaped ones. I told her we could do it after school. Well this was all she could talk about on the ride home. WE had so much fun. She loved the fact that she put EXTRA sprinkles on these ones. We have a Girl Scout meeting tomorrow so all of her friends will be able to enjoy them. I will be working on my secret project. Also trying to finish my crocheted hat I started. I have been looking for a terrific table runner pattern. I love this one you used. Thanks for the giveaway! That's a beautiful runner!! I've been wanting one of those Clover irons, too! Fabric in the table runner is beautiful. I am teaching myself to crochet and have taken out rows and rows and started over numerous times and have only been at it for a couple of hours! Beautiful table runner. Love the colors.